In June 2015, under pressure from people across the Great Lakes region, the Governors of Ohio and Michigan joined the Premier of Ontario and committed to reducing the amount of runoff pollution, specifically phosphorus, flowing into western Lake Erie by 40 percent by 2025. Rescuing Lake Erie: An Assessment of Progress examines the jurisdictions’ progress toward meeting the commitment. The report was authored by the Alliance for the Great Lakes and Freshwater Future. Report findings are supported by Environmental Defence Canada, Ohio Environmental Council, and Michigan League of Conservation Voters. In August of 2014, an unconscionable event occurred. Toledo, Ohio, a major Great Lakes city, had to ban residents from drinking the water it draws from Lake Erie for two and half days. A few weeks later residents of Pelee Island, Ontario faced a similar situation that lasted nearly two weeks. The water was contaminated with microcystin, a liver toxin, from a large toxic algal bloom. Each summer communities and businesses around Lake Erie worry about and plan for toxic algal blooms. They wonder if the algae will pollute their drinking water, harm the region’s vital tourism economy, and prevent residents and visitors from enjoying boating, swimming, and visiting Lake Erie’s shoreline. The situation is unacceptable. Lake Erie – and every Great Lake – ought to be clean and safe for all people, not so polluted that it is a threat to our health, to wildlife, and to the regional economy. 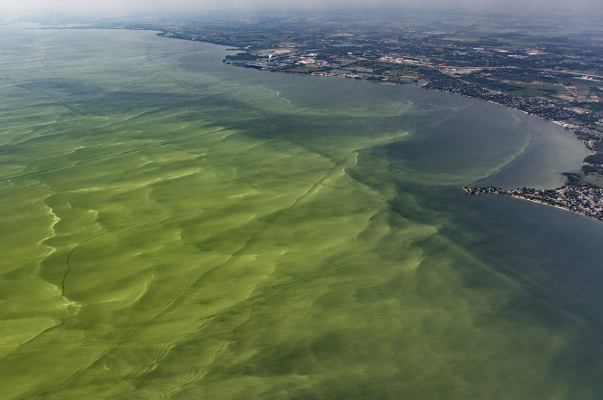 Lake Erie’s harmful algal blooms are caused by runoff pollution. This type of pollution occurs when rainfall and snowmelt wash fertilizer and manure from agricultural fields into streams that flow into the lake. This problem is preventable. Scientists studying Lake Erie report that reducing the amount of runoff pollution will significantly reduce harmful algal blooms and improve the lake’s health. In 2015, under pressure from people across the Great Lakes region, the Governors of Ohio and Michigan joined with the Premier of Ontario to commit to reducing the amount of runoff pollution, specifically phosphorus, flowing into western Lake Erie by 40 percent by 2025. The governments of Ohio, Michigan, and Ontario are on the hook to create clear plans that allocate pollution reduction goals to all sources, including chemical fertilizer, manure, municipal wastewater and more. The Alliance for the Great Lakes and Freshwater Future teamed up to assess progress by the governments of Ohio, Michigan and Ontario toward their commitment of reducing runoff pollution. The groups reviewed current legislation, regulations, and policy in each jurisdiction and consulted with experts to compile a comparative assessment of progress. On Tuesday, October 10th, 2017, we released our findings in an original report, Rescuing Lake Erie: An Assessment of Progress. Read or download the report, Rescuing Lake Erie: An Assessment of Progress or read the report’s executive summary. Rescuing Lake Erie establishes a baseline evaluation of state and provincial policy to assess regional progress on development and implementation of policies for reducing phosphorus pollution across Lake Erie jurisdictions. The findings in the report were compiled using a framework developed by the Alliance for the Great Lakes and Freshwater Future. 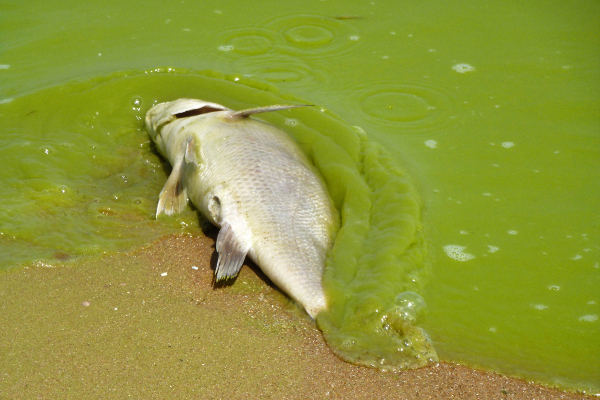 Unfortunately, progress on addressing harmful algal blooms has been painfully slow. Ohio, Michigan, and Ontario have committed to creating clear pollution reduction plans. Sadly, the draft plans they have released are vague and lack clear timelines for implementation and enforcement requirements. Additionally, the jurisdictions have not provided the necessary funding and personnel to ensure implementation of the plans. For a detailed look at our findings, read the full report here. Alliance for the Great Lakes, along with Freshwater Future, Michigan League of Conservation Votes, and Ohio Environmental Council hosted a webinar of their analysis of what’s being done to address Lake Erie’s algae problem. You can view it here. Great Lakes U.S. Governors and Canadian Premiers will meet October 20. Demand their leadership to clean up Lake Erie!